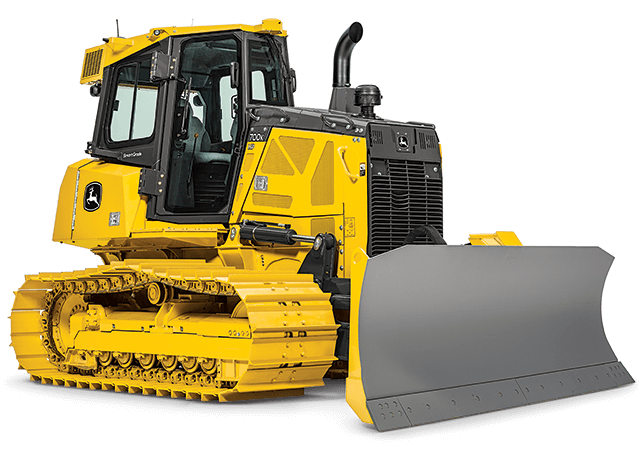 The 700K SmartGrade™ Dozer features a grade-control system that is fully integrated into the machine cabin, structures, and software — delivering precise grading performance while eliminating vulnerable external masts and cables. Auto SmartGrade automatically raises the blade when dealing with heavier loads to prevent stalling and track slip. The complete SmartGrade system is sold and fully supported by the world-class John Deere dealer network. An EPA Final Tier 4 (FT4)/EU Stage IV diesel engine for work in nonattainment areas. And Eco mode for improved fuel efficiency with no loss of productivity. There's more to like in the K-Series — such as a hydraulic-driven fan that provides efficient cooling, reduces noise, and conserves precious fuel. We also include Ultimate Uptime featuring John Deere WorkSight™ in base. You get pre-delivery and follow-up inspections, plus three years of JDLink™ Ultimate telematics, machine-health prognostics, and remote diagnostics and programming.